UK Acid House, Newspapers Articles 89 Northern, 2Go. - It's all about flyers! UK Acid House, Newspapers Articles 89 Northern, 2Go. Regards to a friend who I was we, I was enjoying a rumble with Bizzes. Regards to a friend who I was we until he went into the place…I kept the riot-police BUSY..
Bolton's Press write up on the weekends party which was mentioned on pre	.. Hundreds kept awake by acid din, Farmer denies causing nuisance. I LOVE THE GOOD OLD "Impromptu parties" I had to help with night time entertainment..
National Paper - "Acid house runs out of time"
National Paper - "Cops' Power to KO Ravers"
Cops' Power to KO Ravers - From The Sun Newspaper just before the new C.R.B Law. National Paper - "Legal acid party pleases police"
National Paper - "Too Tame For Tony"
article saying - "Too Tame For Tony"
National Press - "Party is a real stinker"
National Press - "M-Way is Closed by 'Acid' Cops"
Lancashire Evening Telegraph - "Spoiling The Party"
UKacidhouse in the Regional Press - "Acid Swoop"
Regional Paper - "Police clamp on Fun-Seekers"
Regional Press - "Drugs Seized After Acid Party Swoop"
National Press - The Sun "Drug kills acid party teenager"
Local Press - Lancs. 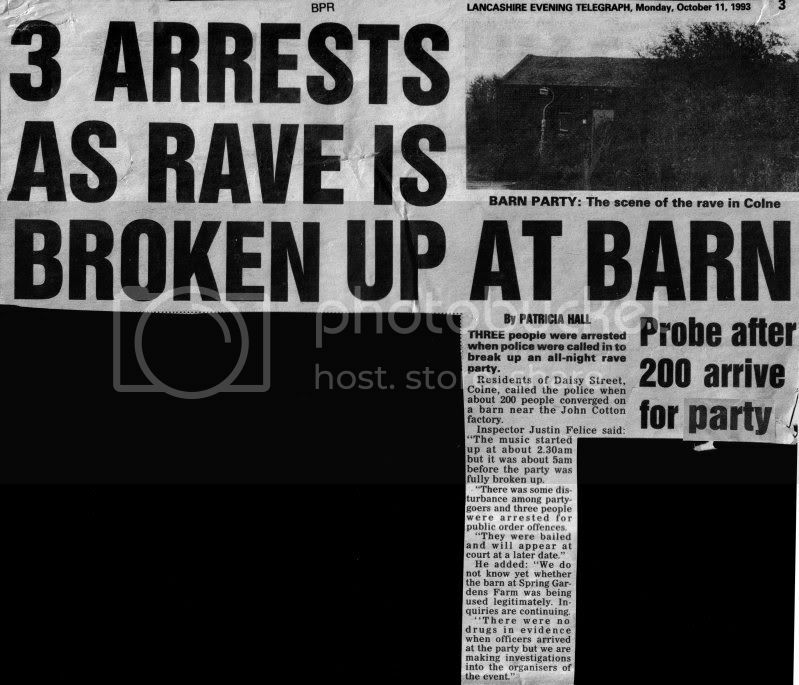 Telegraph "Police tell of drug in club"
Regional Press - "Drug Warning As Club Pair Go To Prison"
UKacidhouse in the Local Press - " Riot Police Halt Rave Party "
UKacidhouse in the Regional Press - "3 Arrests as Rave is Broken Up at Barn"
Sicko Mag prints bomb making tip for hippie yobbos" Refers to "being used on police"
This story was printed in a national paper, saying about " LSD, Trip lasts for 20 years"
I have listed some of them if anyone is interested. Information on the items and flyers listed and to be updated, please email me. Keep checking the temp flyer pages. Re: UK Acid House, Newspapers Articles 89 Northern, 2Go. UKacidhouse, the Press love to hate. 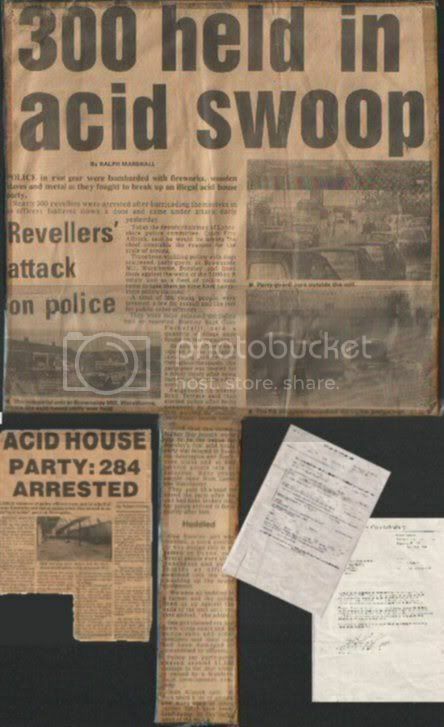 Newspaper Article	Lancashire Evening Telegraph - "Acid House Party Youth Bound Over"	Early 1991	Regards to a friend who I was we until he went into the place…I kept the riot-police BUSY.. Newspaper Article	Local Press "Nightclub acts on 'House' raves fear"	1991	I LOVE THE GOOD OLD "Impromptu parties" I had to help with night time entertainment.. Newspaper Article	Cops Seize 40 Weapons in Rave Swoop, Huge drug haul	4-Nov-1991	Newspaper reports these headlines…. Newspaper Article	National Paper - "Too Tame For Tony"	#	The Sun has an article saying - "Too Tame For Tony"
Newspaper Article	National Press - The Sun "Party is a real stinker"	#	National Press - The Sun "Party is a real stinker"
Newspaper Article	National Press - "..Bomb making tips for hippie yobs"	1992	" Sicko Mag prints bomb making tip for hippie yobbos" Refers to "being used on police"
Newspaper Article	National Press - "LSD Trip lasts for 20 years"	26-Jan-1992	This story was printed in a national paper, saying about " LSD, Trip lasts for 20 years"
Admission Pass	AFTERLIFE, Burnley (ex ClubXPOBar)	#	Free Admission pass for a night at the new Afterlife Nightclub in Burnley, to see the man called DJ Pintsize. Artwork - One-off	D.T.R 's - Vision of the Future feat Worms On'	#	Nice A4 pencil drawing done by the infer-muss DTR… "worms on acid"
Audio	Also see: Media, Music sections. Other lists for others. From 1988	I've always had a love for music. My dad is a dj and since the age of 13 love any kind of partying and music. Audio - Recording	REVENGE 6'cont. Recording taken by me, outside the crazy party in 1990	1990	The antics can be heard with shouting from both sides. Partygoers, Riot Police in Westhoughton. Audio - Recording	Def-Con Revenge Hype Tape from Mr K's 1990	1990	90min Mix with DJ Welly, John J and the Dread MC along with all the Revenge atmosphere. Book	Disco Biscuits - edited by Sarah Champion	1997	Fiction book published by Sceptre. Book	My School Book, backed with various flyers..	1990/1991	Dance Planet, Zone, Lucarave, Off the Ground, The love decade..
Drug - Information	Postcard "whatnottoshare"	#	Postcard with a rolled bank note as picture, regards the cpntracting of hep c.
Drug - Information - Order Form	LIFELINE's Leaflets, Guides. Peanut Pete Range, Ecstasy PO Cards, Dance Drugs. 1992	Full Details & Information on the Leaflets, Guides, Postcards towards drug awareness. LifeLine Manchester. Event - Ticket	The Ultimate Revival, Bowlers - The Official Reunion	30th July 2011	Ticket for this fantastic event at Bowlers. Baby D, Shades Of Rhythm, Dream Frequency, K-Klass, Welly, Vertigo, Greenbins. Event Notice - Poster	Warning - ILLEGAL SUBSTANCES	#	Warning, Anyone found to be using or possessing ILLEGAL SUBSTANCES…. Will be repoted to the police..
Fanzine -	Ear To The Ground - 8 - Raveheads from outa space	1991	Number 8,with more reports and reviews and some great cartoons. Raveheads from..
Flyer	ETERNITY, The Magazine (now available in…)	13th January ? "The most controversial underground dance magazine"
Flyer	Ace of Clubs - Flyer to promote Issue 1	#	Issue 1 of a new underground dance magazine for the north. Flyer	Ace of Clubs - Flyer to promote Issue 2	#	issue 2 of the new underground dance magazine for the north. Flyer	102.5 FM (Blackburn's pirate info radio)	1990	Top D.J.S and Tunes, "You Know It Makes Sense"
Magazine	Mixmag - Issue 118 - March 2001 "Daft Punk"	Mar-01	Le plus grand journal de disco-dance dans le monde. Daft Punk - Release the Greatest Album Ever..
Magazine Supplement	D.J Magazines - 16 Page Guide To The Top UK Dance Labels. Nov-91	This very colourful booklet was with the Nov-issues of DJ Mag. Full of very useful info for and towards your music. Magazine Supplement	RAGE - You Gotta Have It.	? The 250 must have items - haircuts, t-shirts, gadgets, the rest of what people thought..
Magazines - Various	MUSIC MAGAZINES == NOW LISTED	LISTED	Various Club & Music Magazines, D.J, MixMag, Ministry, Muzik, Eternity plus many more. Mailout - Fanzine	BIG BEAT BUZZ , Issue 1, The Big Beats Update. 28-Apr-1991	This fanzine produced by the northwest's Big Beat crew at Radio Lancashire. With updates on music and up coming events. Media - Audio & Visual	Please see the within this list and others. EMAIL 4 INFO	All other types of Media - Audio Visual. Membership Card	FREEDOM , Monroes, Gt Harwood. (BLACK)	1990	The very much needed Monroes freedom card…. Which dint mean ya was getting in.. Membership Card	ANGELS, Nightclub, Burnley. 1991/92	The membership for angels at Burnley.. Membership Info	Clubline Membership - Clubline (the joy of life)	#	Details of the new membership for updates on all up & coming club nights and events..
Music - Culture Magazine	ETERNITY - ISSUE No. 1 (The first issue of the Eternity)	Dec-92	This copy of Eternity was given to me outside the orbit nightclub. A Fantastic read..
Music - Samples Music & Media of UKAcidHouse & Samples by DJ De'ja'vu. EMAIL 4 INFO	Various music video and media samples, complied & edited for use in most Audio & Visual sets. 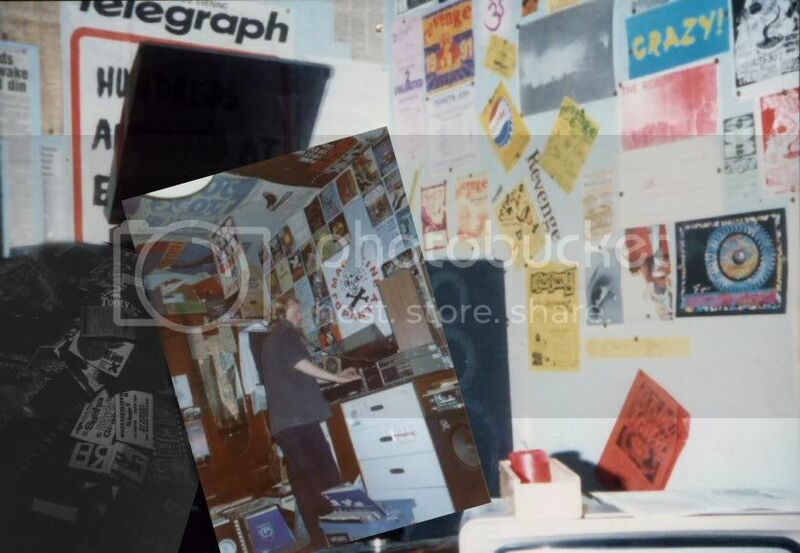 Music Related Item	Fat City Records, Manchester (Opening)	Feb-93	13/02/1993 Opening of a new specialist record shop…! Music Release Flyer	Flyer to promote the release of Full On Edition One - 8-Feb-1993	Details and track listing of the Liverpool based albums "A Year In the life of House Music"
Music Release Flyer	Ministry Of Sound - The Annual II, Club Listings, Merchandise	1996	Ministry Of Sound - The Annual II, Club Listings for December & NYE, Classic Range, Classic Cut Recordings, Order Form. Music Release Mailed Item	STRESS RECORDS - "From Stress With Love" - The Summer Collection	1996	Details of Four Stress releases, summer parties. Party Guide	Partysan uk No5	05-Jan	A good 30 page guide. Personal Letter	Lancashire Constabulary, Letter from the "Top Plod Bod"	1990	"On the morning of Sunday 25th November, 1990 when you were arrested at an illegal event". Postcard - Various	National Drugs Helpline - "What do you know about" Cocaine? #	Postcard = To promote the National Drugs Helpline - "What do you know about" Cocaine? Visual - Media	Television BBC News Report, Look North West, Blackburn. 1990	A recording of just one of the many local TV news reports, most seen on a Monday.. Window Sticker	Angels Nightclub, Burnley. #	Angels Logo, Red - Blue, The club with the..
Flyer - Membership Details	The Fourth Dimension Productions - The Time Day	Jun-05	Membership Info Flyer for the Private Events by Fourth Dimension Productions "The Time Day"
V.I.P Night Entry Invite	Equinox Nightclub, Nelson, Lancs. 26th 28th Aug 99	V.I.P Night Entry Invite for the New Equinox Nightclub in Nelson. Event Ticket - Pass	Futurology, Bluenote, Todmorden. The lam pass for the night. 2001	The laminated passes, ticket. transport and entry into this fantastic night out.Design by Ukacidhouse. Party Passes - Invite - Tickets	Moonlighting Productions Presents "F..Real" NYE 1999/2000 - Private Venue	31st Dec 1999	Laminated Party Invite for this Private Event for the Mell New Years Eve 1999 - 2000. Design by DeJaVu. Party Passes - Invite - Tickets	Moonlighting Productions Presents "Keep it Real" - Private Venue	27th May 2000	Laminated Party Pass for this follow up Private Event. Design by DeJaVu. Event Ticket - Pass	Chaos Theory pt1, Baxters, Todmorden. 25th April 1998	Laminated ticket for this night. Guest Passes	Perpetual, Afterlife, Burnley. 2nd March 2002	Two Guest passes for the New Night in Burnley at the Afterlife, Burnley. Flyer - Guest VIP	The Bassment, Nelson. Dec - NYE 1993	Flyer with Hand written Guest VIP invite entry for any of the nights. Ticket	Easy & Love to Be, Afterdark Club Skipton. 24th May 1996	On Line Promotions Presents, "EASY with guests Love To Be"
Event Advice Card	The Warehouse Project - Lost Property in WHP? Dec-12	Advice card incase of lost property. Admission Card	Odyssey at Time and Space, The Midway. Nov-96	For the new night at Time and Space, Odyssey.